When I hear the term “shovel-ready projects” or references to employment with funding by the 2009 stimulus bill, I flash back in time to a real “shovel-ready project,” when I worked for a federal agency in New Mexico, in 1962. It was Thursday, November 1, 1962, Albuquerque. Six of us U.S. Bureau of Land Management employees, about half the staff, were eating lunch, when we had a telephone call from state headquarters, Santa Fe. We learned that President John F. Kennedy had just authorized $400 million, for a nationwide accelerated public works program (AWP). We had our own wish list, had talked and planned, but with little funding, we had not been able to get this work done. Our state office did not know how much funding we’d get, just that President Kennedy wanted projects started immediately, with photographs of workers on his desk in Washington, D.C., on Monday, November 5, when he would officially announce the program’s beginning. In the BLM office, I was range manager. 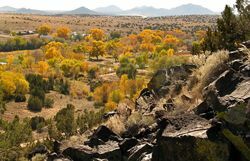 Our responsibilities were for one-and-a-quarter million acres of public lands, north of Albuquerque to the Colorado border. The late Claude Martin was district manager. I’m left to tell the story. That afternoon, with enthusiasm, we discussed possible projects for northern New Mexico: range improvements, especially in the arid Rio Puerco watershed; forest work, thinning and reseeding fire breaks; recreation development, not even a program in 1962. 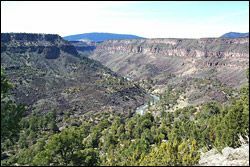 We contacted the New Mexico State Park Division, which had a plan on its shelf to develop recreation facilities along the Rio Grande, where the river ran swiftly through a deep canyon. Yes! We were definitely shovel-ready. This became our priority project for the BLM in New Mexico, with NM Parks providing its plan and a staff member. By 4 pm that day, I was driving a BLM pickup to Taos, with orders to buy wheelbarrows, shovels, picks, hand tools for 100 people. Occasionally, I heard the bulky mobile radio in the pickup crackle, with voices coming through static to tell me that the state employment office was announcing hiring processes. They would open a hiring hall in Taos Plaza at 8 am, Friday, just hours away. From Taos’s two hardware stores, I bought with government purchase orders the stores’ entire stocks of wheelbarrows, shovels, picks, canteens, first-aid kits, heavy gloves. I stayed in Taos, to watch and take photos, with a 4×5 Speed Graphic camera, of the hiring. A BLM team arrived. The late Walt Stone was named project director. We decided to set up a second project, forest improvement, near Peñasco, NM, with Jack Dossett in charge. He’d been pushing for needed work there. On Saturday, November 3, I guided a school bus filled with our first workers to the Rio Grande site. I knew of an old sheep trail down from the mesa to the river. This made sense as a route for a hiking trail. It’s called The Chiflo Trail, and it is about 2,560 feet in length, with an elevation drop of 320 feet. The late Les Lawrence, a BLM employee who had worked with the Civilian Conservation Corps in the late 1930s, came out to help survey and run levels to meet trail standards. On my mind was the order, “Photos! President Kennedy wants photos by Monday!” This was pre-computer days. I knew telephone, telegraph, teletype as modern communication. I loaded film packs into that Speed Graphic. I tried to become camera-ready. The BLM public affairs officer, Doyle Kline, came to the site. He took more photos showing shovel-ready, shovels working, magnificent scenery. Late Saturday evening, I drove from the site, nearly 200 miles south to the Albuquerque airport, carrying a bag of undeveloped film. I hurried through the airport building (no security) to get the bag onto a 9:30 pm flight. In Washington, D.C., a BLM employee met that plane, had the film developed. Photos of the workers at our Rio Grande project were on President Kennedy’s desk, Monday morning, on time. At the height of this accelerated works program, about 300 workers were employed in the Albuquerque district, plus several contractors with heavy equipment. Besides the Rio Grande and Peñasco projects, we had funding for range improvement in the Rio Puerco and other sites. For recreation areas, this was the beginning—openings to the public and later designation of the Rio Grande as a Wild and Scenic River. We discovered projects that we had considered, had hoped for, that were finally possible, because we were shovel-ready. We cooperated with other agencies, and found people who were motivated to work. One of my most interesting times was going north to Fort Carson, Colorado, with BLM friend Jerry Kendrick, to pick up eight surplus three-quarter-ton GI trucks, World War II vintage, loaded with hand tools. We put those to good use in northern New Mexico. On April 16, 1963, President Kennedy recognized our programs’ success. He asked Congress for an additional $500 million. Congress denied more funding. The work had to end. On November 22, 1963, Jack Dossett and I were in Peñasco, passing out final checks to about 30 workers. We could see how the income had made many changes, not just in our projects, but also in the lives of hundreds of people who had been employed. Throughout the area, we saw sparkling new tin roofs on adobe houses, new pickup trucks, heard good news about local economies. The small black-and-white TV in the café where we sat with workers sputtered out a bulletin, bleak news from Dallas, Texas. As we drove back toward Albuquerque, our BLM radio crackled to confirm our nation’s loss of President Kennedy. Today, I can stand on the rim of the Rio Grande and look out at what was once a sheep trail, and now is a small part of a well-used recreation area. I can see visitors aim digital cameras to send photos around the world, immediately. I can hear them describe, on cell phones, what they see, what their plans are. I can watch them explore this place, their own, their public lands. The New Mexico History Museum proudly hosted a naturalization service this morning for 50 people from 15 countries who packed the 200-seat auditorium with even prouder family and friends. We’ve wanted to hold such an event here since opening in 2009 and we got to the finish line on two important occasions: Flag Day in the Centennial of the year New Mexico became a state. 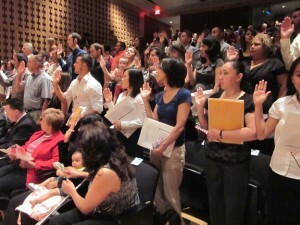 Those being sworn in under the authority of the U.S. Citizenship and Immigration Service were young and not-so-young and represented the nations of Egypt, El Salvador, Germany, Guatemala, Honduras, Israel, Japan, Mexico, Pakistan, the Philippines, South Africa, South Korea, St. Vincent & The Grenadines, Taiwan, and Vietnam. Among those being sworn in were two men who have already protected our nation as members of the U.S. military. Carlos Jose Vergara Alegre, from the Philippines, served honorably in the U.S. Marine Corps from October 2002 until October 2006. And Mario Alberto Vazquez Andrade, from Mexico, served honorably in the U.S. Army from September 2006 until June 2010. In honor of Flag Day, the new citizens were given miniature flags as they signed in. But as a special treat in honor of the Centennial, the History Museum gave them a second miniature flag with just 47 stars–a remembrance of taking the oath on the anniversary of New Mexico becoming the 47th state. 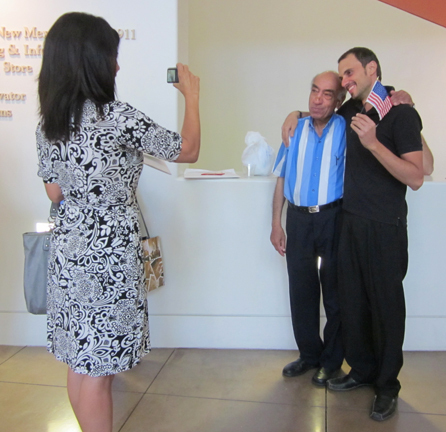 We all celebrated afterward with lemonade and cookies in the lobby (thank you, Women’s Board of the Museum of New Mexico), while the nation’s newest citizens got a head start on their voter registration, Social Security sign-ups, and new passports. Having the building filled with so many happy people, their parents, their children, their sisters and brothers, lifted our spirits into the stratosphere. 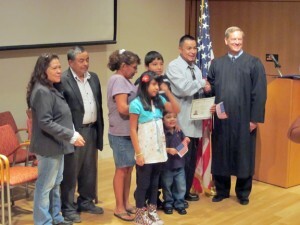 If all goes well, the History Museum will become an annual host of Citizenship Day. We wish all of the participants the best as they enter this new phase of their lives. Mysterious, artistic, and as low-tech as an oatmeal box, pinhole photography has captivated everyone from schoolchildren to professional photographers for more than a century. The Pinhole Resource Archives, the world’s largest collection of images, books and cameras, just joined New Mexico’s largest archive of photography, the Palace of the Governors Photo Archives at the New Mexico History Museum. The Photo Archives has already digitized hundreds of the images, which can be searched here (click on “Browse Pinhole Resource Collection” or type the word “Pinhole” into the search box). Even in this digital age, pinhole photography remains an intriguing medium. Its continued popularity has been celebrated every April since 2001 with Worldwide Pinhole Photography Day. The 2010 event drew 3,387 images from 67 countries. 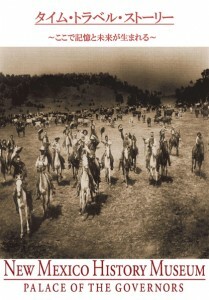 An exhibition of images from this unparalleled collection of pinhole photographs, representing images from New Mexico and around the world, is scheduled for April 2014 Poetics of Light will coincide with Worldwide Pinhole Photography Day. 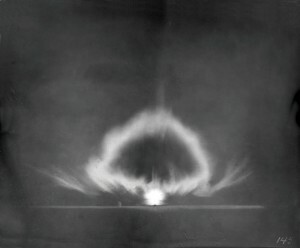 When the atomic bomb test was conducted at the Trinity Site in New Mexico, Julian Mack, working for the Los Alamos National Laboratories, documented the explosion with a pinhole camera (image at left; Palace of the Governors Photo Archives HP.2012.15.775). The Palace of the Governors Photo Archives contains more than 800,000 prints, cased photographs, glass plate negatives, stereographs, photo postcards, lantern slides and more. Almost 20,000 images can be keyword searched on its website. 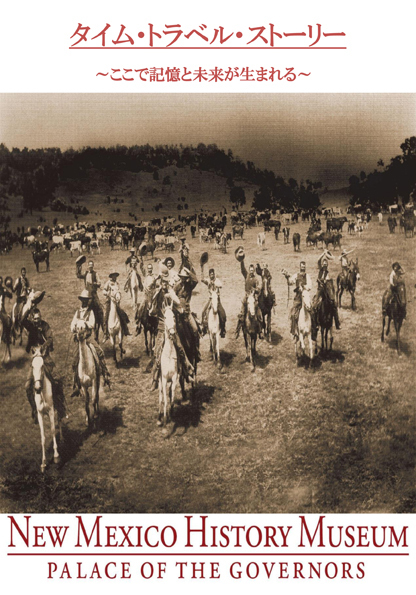 The materials date from approximately 1850 to the present and cover the history and people of New Mexico from some of the most important 19th– and 20th-century photographers of the West—Adolph Bandelier, George C. Bennett, John Candelario, W.H. Cobb, Edward S. Curtis, Charles Lindbergh, Jesse Nusbaum, T. Harmon Parkhurst, Ben Wittick, and many others. Since the New Mexico History Museum opened on May 24, 2009, nearly 45 percent of all our visitors have come from outside the United States. Out of more than 320,000 visitors in all, nearly 4,000 came from Japan. One of them was Mitsuhiro Fujimaki, a professor in the Department of International Studies at the University of Shizuoka, southwest of Mount Fuji on Suruga Bay. A longtime fan of New Mexico and a student of Native American life, Fujimaki visited with museum Director Frances Levine earlier in the year with a proposal: As a class project, his students would develop a Japanese-language brochure that would be available online and at our front desk. A few months later, he brought a half-dozen freshman students to New Mexico, and we talked with them about our focus and what Japanese visitors might be most interested in seeing while here. 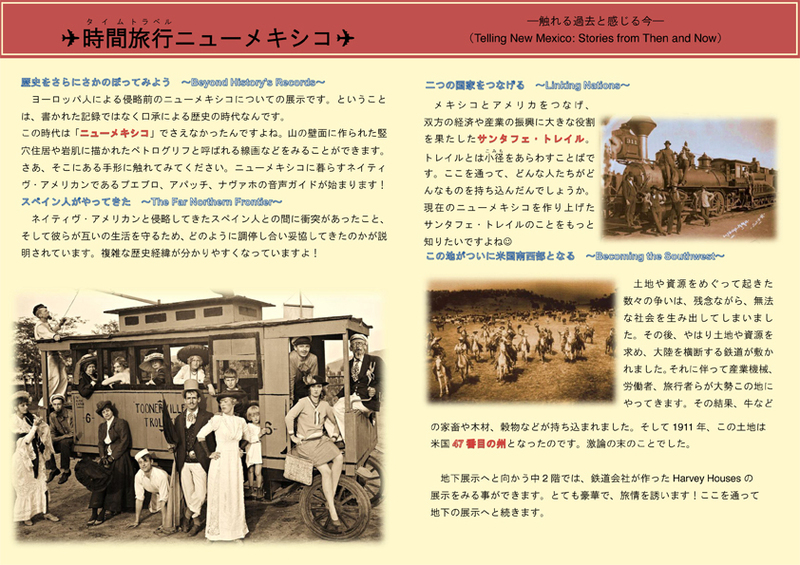 Funded by the Japanese Ministry of Education, the students got to work and, this week, delivered their final product–the Time Travel New Mexico website, with a downloadable History Museum brochure, all in Japanese. Fujimaki explained that the students had to employ some linguistic smarts in preparing the brochure. The direct translation of “history” in Japanese, for example, connotes something boring–“record,” or “archive.” The word “museum” translates as “storage.” So the students opted to use “stories” and “memories,” imparting a lovely piece of poetic license. “We faculty members have recognized that fieldwork is an essential component for the curriculum. And so, we have attempted to introduce an effective program for freshmen as an initiation to our curriculum. Since the last year, we have been fortunate to receive an educational grant from the Ministry to experiment an introductory fieldwork program for freshmen. In this program, freshmen engaged in fieldwork are exposed to various cultural experiences in foreign countries. For example, one group goes to Turkey, while another goes to Australia. Another group goes to Kenya, and the other Vietnam. And through that exposure, they are supposed to acquire fundamental skills and knowledge, necessary to prepare themselves for the rest of their academic life in the major of International Studies and for their future career. “This particular project, by which students have visited Santa Fe is called `Santa Fe Seminar.’ Students have been planning and editing a guidebook to the Santa Fe area. In the previous year, they edited a booklet that introduces Pueblo culture and mentions the copyright problem of Indian jewelry. After their trip to Santa Fe in the last year, they took a look at local shops at their home towns, and have recognized how many stores sell `Indian-inspired’ products, which are usually made somewhere in Asia. So, when they distributed their booklet, they held a workshop to enlighten consumers about the problem in the area. The students’ brochure and those 4,000 visitors aren’t the museum’s only tie to Japan. 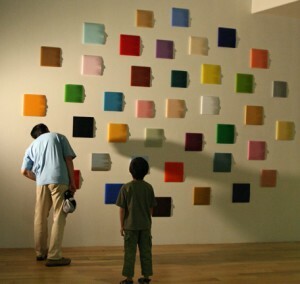 Among the parts of the museum the students recommended seeing was Japanese artist Kumi Yamashita’s Fragments installation in the second-floor Gathering Space. Yamashita took photographs of everyday New Mexicans across the state, then molded their profiles onto the edges of multi-colored squares of plastic. When a light is shined on them from the side, the profiles appear in shadow.